CHICAGO (WLS) -- The Double Door music club was evicted from its space at the heart of Chicago's Wicker Park neighborhood Monday after 23 years. The venue's former location is at the six corner intersection of North Milwaukee Avenue, North Damen Avenue and West North Avenue. 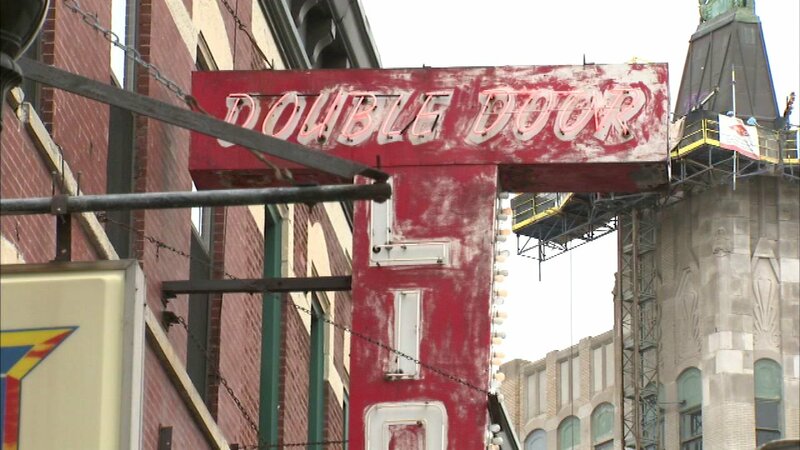 A judge ordered Double Door to move out of the location in July 2016, after landlord Brian Strauss filed paperwork saying the club management failed to properly notify him they wished to extend their lease. But the judge did not set an official end date to their occupation and urged the club and Strauss to come to an agreement that would accommodate the shows that had already been book through March 2017. The venue, which opened in 1994, has hosted acts ranging from an up-and-coming west suburban band called Starchildren - which would later rise to stardom as the Smashing Pumpkins - to the Rolling Stones. But in the years since Double Door opened, rents and property values in Wicker Park have soared. While the legal dispute over the expired lease was pending, Strauss asked to increase the $22,000 per month Double Door had been paying for the 5,000-square-foot space to $33,000. A Cook County Sheriff's Office spokesperson said they enforced an eviction order Monday morning at approximately 9:30 a.m.